ROKPA: Education | Poor families often cannot afford their children to attend school. ROKPA supports these children with education programmes. Every year, ROKPA supports around 4,200 children and students with education programs in the Tibetan highlands. These children come from the poorest social class, mainly orphans and children with only one parent, and nomadic children. We consider education one of the most efficient measures to help the Tibetan people out of poverty sustainably and in the long term. Most Tibetans live as nomads or farmers in the rural regions where there are only a few schools. The level of education is very low, as there is a lack of qualified teachers. 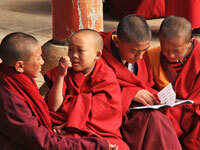 In the past, monasteries played a central role in education. Each family had at least one child who lived in a monastery. Today there are schools, but they are a long way from the nomad regions and the teaching language is Chinese. The government has made it obligatory for all children to attend school for at least nine years. Despite this ruling, poor families often cannot afford their children to attend school, as there is simply no money to cover the additional costs of accommodation and meals.